Musings of a (mostly) Self-Taught Knitter: Mystery Solved!! 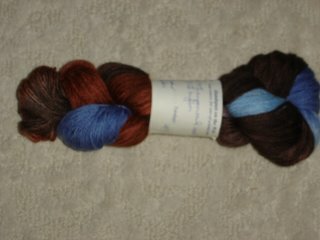 Remember the yarn I bought last week at Modern Yarn? The pretty Handspun on the Web, that I couldn't find a web-site for? Well, as luck would have it, the gal who was working that night came searching for my blog (um, yeah, I mentioned I had a blog when I asked if I could take photos in the shop) and left me a comment with the web address!! Handspun on the Web is here! From what I can tell, they are only selling to yarn stores right now, but I was really glad to be able to check out the site and read more about that yarn. Thank you so much, Xtina. I didn't have an address to e-mail you back, but I'll leave a comment on your blog soon. So, as you can guess, I was in New Jersey last week. I didn't blog much about it (I think I'm trying to block most of the week out), and the highlight of the trip was certainly Modern Yarn. I've re-read my post and realized I may not have sounded overly enthused about the store, but it really was a wonderful shop and if it were closer I would certainly be a regular. When I wrote the post last week, I was very home-sick! Pea was sent down to NJ for training, and I decided to go with him. I planned to spend my days in our hotel room, knitting, reading, blogging and working on graphics. As it turned out, the hotel was less than ideal. The high-speed internet was slower than my old dial-up. The rooms were not made up until 2 or 3 in the afternoon, thus making me feel like I should stay in the lobby so Housekeeping could get in there. ( And one day, our room was not made up at all.) I got stuck in the elevator. And we had two (yes, TWO) ant infestations. The second was on Thursday night, interrupting my enjoyment of the Grey's Anatomy season opener. (Grrr) When we trudged down to the front desk (in my pajamas, I might add) to report that the wall NEXT TO OUR BED was crawling with ants, the manager (yes, MANAGER) on duty replied with "Well, you've been here all week. You're just having a problem now?" Why yes, because we thought it would be fun to pack up all our stuff the night before check out - in our pajamas - and move to a new room. That's how we get our kicks. He never even apologized for our inconvenience. Yeah, now that I've vented to all of you, I'm going to vent to their corporate headquarters. So anyway, if my report of Modern Yarn was not as enthusiastic as it should have been, please know it was due to my frustration of being stuck in the Hotel from Hell. Hindsight is everything, and we should have begun complaining on Monday, but Pea and I aren't usually the kind to make waves. But next time, yeah, we'll be making a whole lot of waves. And one more note, I found out later that Kirsten had been at Modern Yarns just five hours before with her knitting group. I don't like to advertise on my blog when I'll be away, but I'm kicking myself for not finding a way to mention I'd be in the vicinity of Modern Yarns. I would have loved to have met up with her. Well, enough whining. Many of you commented that you enjoyed seeing some of my stash in the background of my Ice Cream Man sock picture. Well, if you've got it, flaunt it, right? I thought I'd share a picture of my Out Of Control Sock Yarn Stash, so you can all understand why I shouldn't be buying any more sock yarn for at least five years. What you see there, according to my Stash Spreadsheet, is enough yarn to knit . . . . are you ready? . . . FORTY THREE PAIRS OF SOCKS!!!! How did this happen? Do you remember when my sock stash looked like this ? (Scroll down a little) Or if you really want to laugh, like this? (Scroll down again) The funniest thing is if you read the second post, I thought I was out of control then. I had yarn for only nine pairs, and I thought I was out of control!! I was such a novice!!! And right on cue, my evil lovely friend Nathalie has been tempting me with links to one of her favorite yarn sources and pointing out the great exchange rate from AUD to USD. Sweetie, you are killing me!! Must. Resist. No yarn until RHINEBECK!!!! Wow! That's a lot of socks-to-be. It's really a beauty to behold--your sock yarn stash, that is. I went to check out the pretty yarn at The Knittery and did you notice they have a yarn called Posmerino? Part merino part possum! I want some! Major drag about Chez Fleabag. I hope you didn't bring any ants home in your luggage! wow. um. wow. gettin' up there, girl! another thing that helps is to put it where you can't see it; out of sight, out of mind. Okay, I want to know which hotel this is so I can AVOID it like the plague! The other side of the coin is at least you found a cool yarn shop to visit. CRAWLING with ants?!?! ugh! I hope your complaint to the corporate office gets you the 'I'm sorry' you should have gotten from the manager :o\ What a dink. WOW! That is a great looking yarn stash! I have had a bad NJ experience...at Newark airport during one of the really bad storms that hit the area. We were iced in for 3 days (yes at the airport). Lovely. Anyhoo...thank you for your comments on Bella. 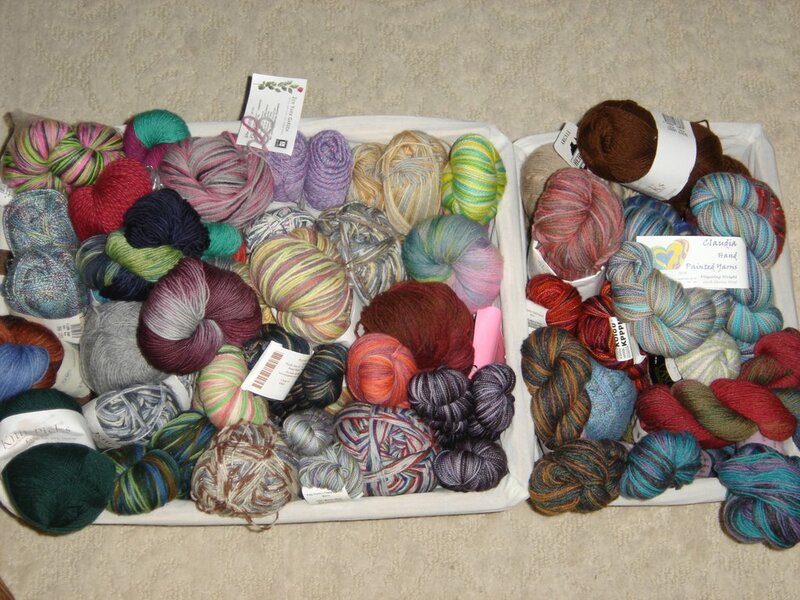 Each skein of yarn in that stash is screaming "knit me, knit me!" Sorry your hotel room was so bad. What a lousy way to spend a week. I'm sure Modern Yarns was the highlight. It is a wonderful store. Sorry to hear about your hotel room. I would certainly complain. That's just not cool! Great sock yarns. They also have some wonderful socks yarns are Rhinebeck and you only have to hold out for a few more weeks! Oh heavens, what a stash - these yarns might make for a couple of months of nonstop-sock-knitting, no? How great, and they all look so cool! I'm so sorry to hear about the hotel room from hell, such things can make trips horribly miserable! Poor you, you'd so have deserved a better time in NJ - and a better room! Ok, being interrupted during the Grey's Anatomy season premiere is TOTALLY unacceptable! (fyi: if you go to the ABC website you can watch all this season's episodes for free!). Nothing like less than friendly hotel employees to put a damper on the vacation!! Glad you had fun, anyway.